Workload capabilities and parameters, creation (step-by-step), assignation, percent weighting, interaction filters, time ranges, and more. 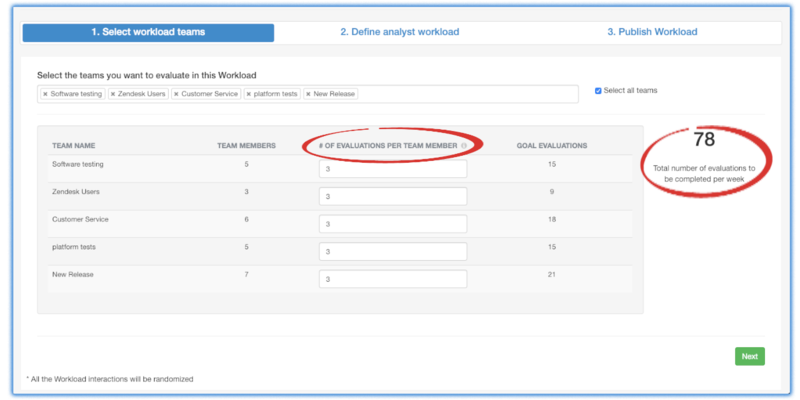 Analysts can be assigned to multiple workloads. Workloads automatically distribute customer interactions to analysts. Each workload pulls and assigns customer interactions for a one-week duration. The same workload automatically resets week-over-week. All customer interactions are randomly selected and distributed to analysts without the analyst's intervention. Any edits to a Live workload are reflected in the following week's assignments. A workload week begins on the day a workload is activated Live. Go to the Quality application on the main navigation bar of PlayVox. Click on the Workloads item in the submenu. As you create workloads, you will see them listed (as shown above) with status information, who created the workload, and last assignment date. Options include the ability to edit workloads or run reports on workload assignments and goals. Also, make sure to have the Analyst mode Off as shown in the image above. 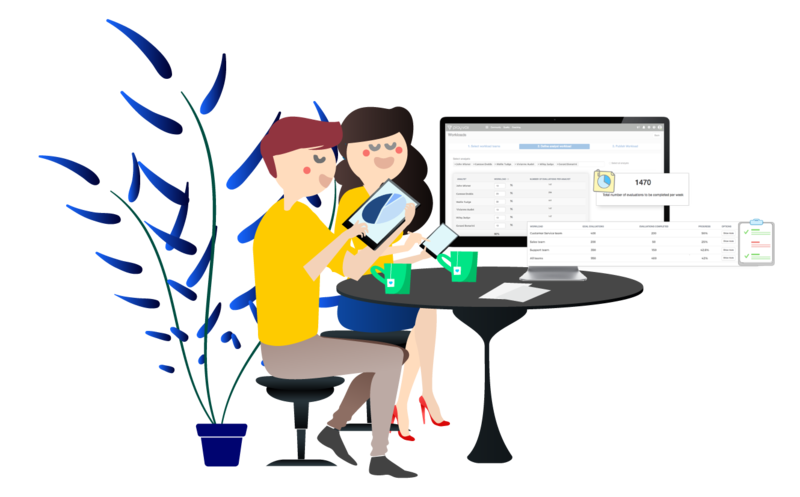 This is a special feature for those Admins who are part of a workload as an analyst and would like to jump from one view to the other easily. Beware, once you've turned the option either On or Off, the platform will save that setting, even if you log out from it. Depending on the Mode you are on, either permissions or restrictions will apply accordingly. Now, creating a workload is a simple process..
Click on the green Create a workload button in the upper right. Start by creating or selecting a workload team of agents. These teams may already exist as agent teams on the PlayVox platform with team leader designations. Select a team from the drop down window. 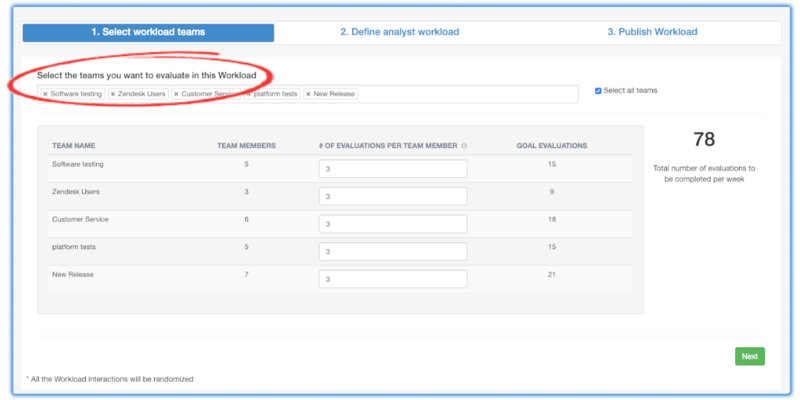 Or, create new teams specific to the needs of the quality analyst assignments. 3. Next, indicate how many evaluations per week you expect to be conducted for each agent on a team. The number of agent team members is shown for each team. You must enter the number of expected evaluations per week for each agent on that team. PlayVox will indicate, in the far right column, how many evaluations are required per week for the entire team of agents. Notice that according to the analysts' percentage assignation, the workload may or may not be able to assign all the desired weekly evaluations. Workload percentages might result in a decimal number, therefore, PlayVox will round down to the nearest whole number. Workloads pull and assign interactions to analysts on a weekly basis. Each week the workload automatically resets with new customer interaction assignments using the parameters set. 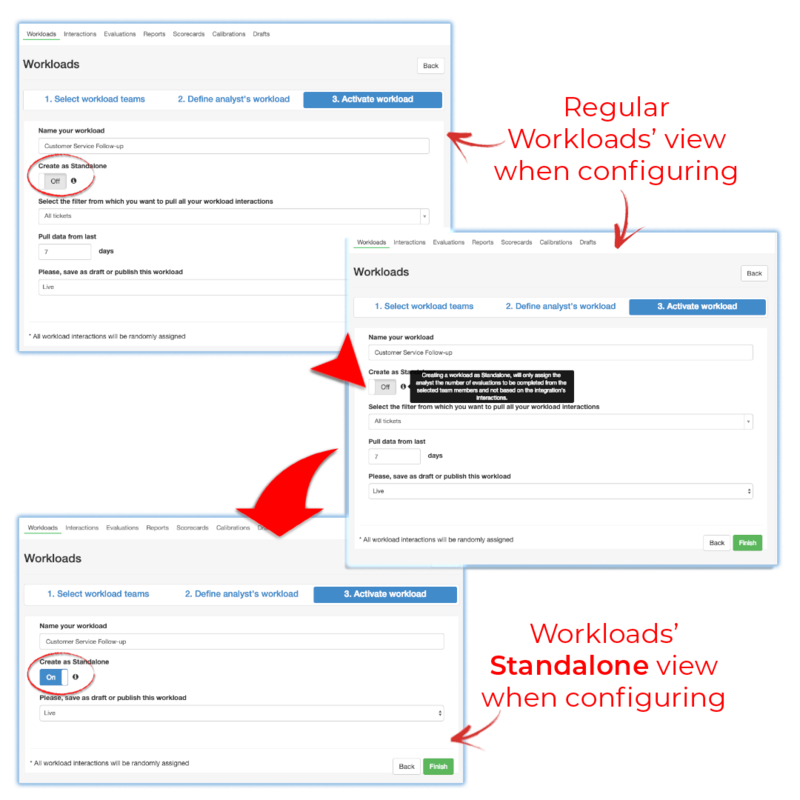 Configure a workload once, and it runs automatically every week. 4. When finished, hit the green Next button at the bottom right corner of the screen. Or click on the next section: 2. Define analyst workload. 5. Next, you will define the workload for each analyst. Not every analyst may have the same workload. 6. Select the analysts that will participate in this workload. You can select multiple analysts. PlayVox will calculate the number of evaluations to be assigned each week to each analyst. PlayVox assumes an equal percentage weighting of evaluations for each analyst. You can adjust the percent weighting as needed. 7. Click on the next section, 3. Publish Workload, or the green Next button in the bottom right corner of the screen. 8. Provide a name for your workload. You might choose to categorize your workloads by team name, by interaction types (filter type), or expert levels of quality analysts. 9. Then decide whether you want the workload to be regular or standalone. But what does this mean? Regular Workloads: you'll be able to Select filters..., you may choose a filter to be used to determine the source or type of interactions to be assigned in this workload. Only one filter can be set for each workload. Evaluations found will depend on them being available - otherwise the "found available evaluations" will be shown and used for the week's workload. A Regular Workload requires to type-in the number of days (prior to current date) you'd like the workloads to pull tickets from - slot shown below. The higher the number, the wider option range of tickets to be randomly assigned. Standalone Workloads: in this case there will be no filters to choose from, therefore, creating a workload as standalone will only assign analysts' the number of evaluations to be completed from the selected team members and not based on an integration's interactions. With this option you will always find the 100% of the evaluations. 11. Finally, choose Draft to keep the workload as a draft or select Live to publish the workload. 2. Click on the green Finish button in the bottom right corner to save your workload. When published, the workload will automatically begin to select and distribute customer interactions to analysts based on workload parameters that you set. Customer interactions are selected randomly in order to fairly balance analyst workloads and avoid differences in workload difficulty. A workload resets automatically week-over-week. If edits are made to a workload, interaction assignments will be reflected at the start of the next week. An obvious point perhaps - the tighter the criteria for Interaction filters, the fewer the interactions we will pull and assign. If you experience interaction numbers too small to meet your QA goals for evaluations, you might loosen the criteria filters for interactions to increase the pool of interactions. Widen the day range settings on the interactions filters. Customers find this to be a balance between pulling and evaluating the most recent interactions (within one day) versus having a wider day range (e.g., 7 days) in the past to pull sufficient numbers of interactions for QA staff evaluation. Review and set the day range for the new Workloads day range filter. This becomes the default day range for pulling interactions for each week's workload. If insufficient interactions are pulled for agent evaluation, you might increase the number of days looking back as the Workload selection filter.